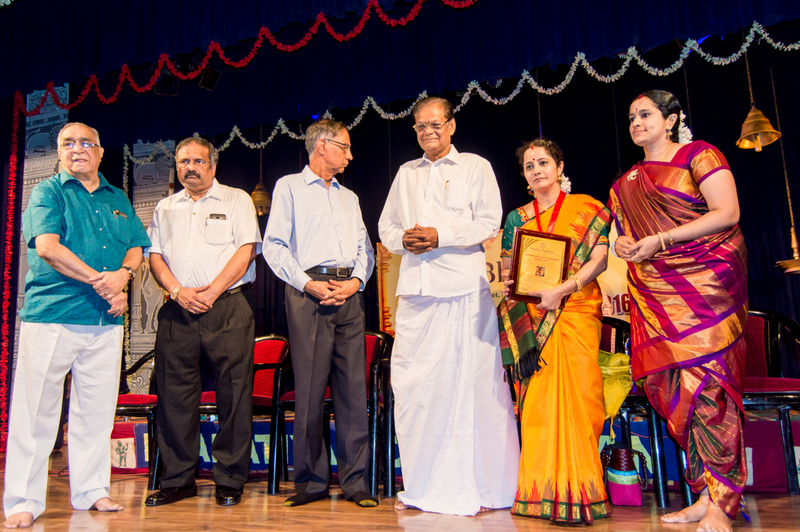 For the past 73 years, the Thamizh Isai Sangam has been hosting a music festival in December, promoting exclusively the Thamizh compositions. Top artistes perform at this festival. For those in the neighbourhood beyond T. Nagar, this is a major festival to look forward to every year. This is the sabha's 20th year festival. This year the festival is held with the support of V. Narayana Iyer Memorial Trust and Dinamalar, Tamil daily. 7.00 pm - "Laya Raaga Samarpanam" by " Sthree Thaal Tharang"
A short one-week music festival by Nalinakanti this season. An early morning chamber music is one many rasikas as well as performers love to be part of, during the December Season. 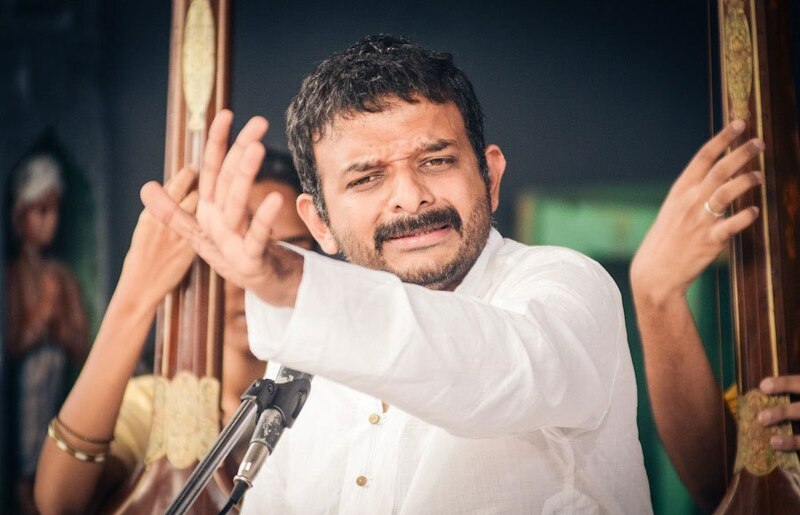 The Venkataramans host the series of concerts at their residence in Luz Avenue in Mylapore. You could just drop by and listen to the music in a traditional ambience. This year, the annual music festival of Chennai Fine Arts is dedicated to the memory of Dr. M. Balamuralikrishna. The organisation presents the Gottuvadyam Narayana Iyengar Award for Excellence to violinist T. Rukmini. The festival is held from Dec. 21 to 28, 2016 at Srinivasa Sastri Hall (Ranade Library Upstairs), Luz Church Road, Mylapore, Chennai 600 004. A music festival that starts on the 1st of December every year and spans across two different venues with more than 300 concerts in the schedule in that of Kartik Fine Arts. The festival includes a seminar and performances in dance as part of it. The concerts are well-attended and tickets sell out very fast. Few donor passes will be available at Narada Gana Sabha Hall only (1-12-2016 to 13-12-2016) Contact: 9840358805. Mrs. G.V. Aparna) to Ms. Rathna Kumar, Lifetime Achivement Award to Shri Raja & Smt. Radha Reddy. 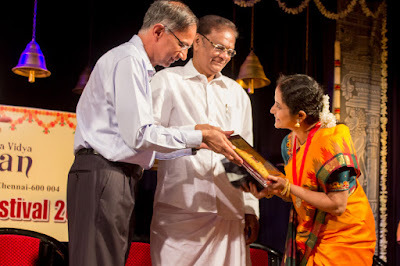 Nrithyajyothi Award Exellence in Bharathanatyam to Ms. Mathura Viswanathan Vijay. As in the past, the December music season begins early in November with Bharatiya Vidya Bhavan's annual cultural festival today. And as ever, the hall is packed and the rasikas sit tight through the award presentation and the performance that follows. Today, Vishakha Hari, popular Harikatha exponent and Gayathri Venkataraghavan, one of the much-loved musician by the rasikas received the P. Obul Reddy and P. Gnanambal Memorial Life Time Achievement Awards. 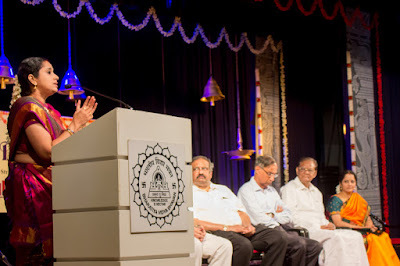 What followed for was an emotional presentation of stories of Krishna with melodious songs by various composers by Vishakha Hari in her own inimitable style. 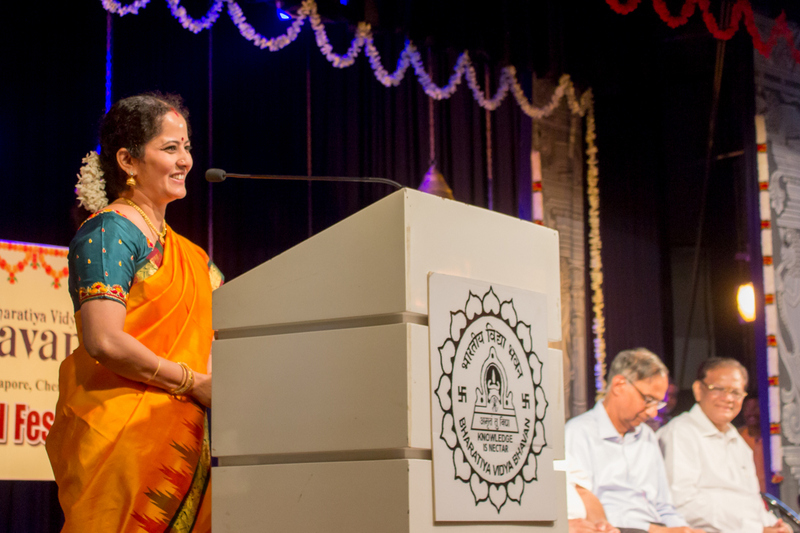 Here are a few photos from Day 1 of the 'season' from Bharatiya Vidya Bhavan in Mylapore. When a new hall in the heart of Mylapore was opened for public on Nov. 26, 2010, many thought that it would be used more for meetings as the name suggested -Arkay Convention Centre. But in reality, the hall turned out to be one of the best venues for classical music. With its size suiting to passionate performances that connect with the audience so very well, the hall is now much sought after by the organisers. Arkay or Ramakrishnan has founded the in-house sabha, Madhuradhwani soon after the hall began successfully hosting events by other organisers. Entering into its seventh year, Madhuradhwani joins the big band of December Season Concerts by organising a festival in two parts. One to celebrate the venue's anniversary and the other as the annual festival of the sabha. Auspiciously beginning with the nadaswaram concerts of Thirumeignanam Brothers T K R Ayyappan and T K R Meenakshi Sundaram, the sabha launched into its next year of good music. 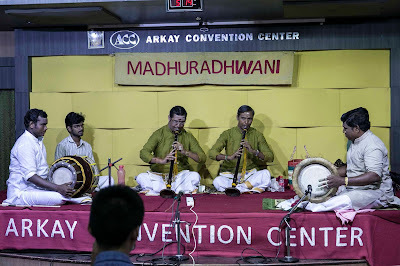 Senior vidwan Neyveli Santhana Gopalan presented a melodious concert on Day One. 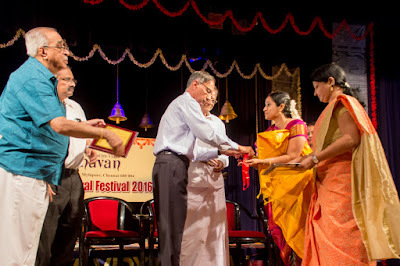 Maximum Media, Vijay TV and Ragamalika TV host the 17th year of Margazhi Maha Utsavam from Dec. 1 to 15, 2016. The series is supported by Hamsadhwani. The concerts are not tickets. But seats are on first-come-first-served basis. It is Bharatiya Vidya Bhavan, Chennai that sets the beginning of the 'December season' well ahead of other sabhas. Top artistes perform here and the concerts are not ticketed. Also, the venue has very good acoustics and the listeners love the experience at the hall that is in the heart of the city, Mylapore! This year the festival is held in two parts. The first edition will be on from Nov. 20, 2016 till Dec. 13, 2016. The second part of the festival will be held from Dec. 26, 2016 to Jan. 14, 2017 (The schedule will be updated in due course). 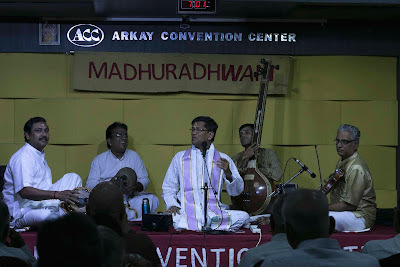 Madhuradhwani conducts its December Music Festival in two parts. The first of the series is held to celebrate Arkay Convention Center's Seventh Anniversary and the second is the annual music festival of Madhuradhwani. 4.00-6.00 p.m. - Thirumeignanam T K R Ayyappan and T K R Meenakshi Sundram - Nadaswaram, Thirukadayur D G Babu - Tavil. 10.00 a.m. - Nishanth Thyagarajan - Vocal, Kamalakaran Vinjimuri - Violin, Kishore Ramesh - Mridangam. 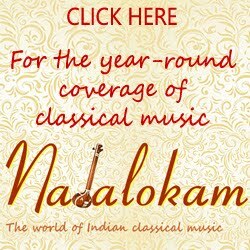 11.30 a.m. - K. Sathyanarayanan - Keyboard, B. Ananthakrishnan - Violin, Madurai Venkatasubramanian - Mridangam, Hariharasharma - Kanjeera. Charsur, an organisation that aims to record and archive good music hosts a music festival during the December 'season'. The concerts are usually well-attended and most of them see a packed audience. This year the festival starts on Dec. 16, 2016 and goes on till Dec. 26, 2016. Get your Donor Pass of Rs. 500 for the Season and Rs. 100 as a daily pass up to the 20th and Rs, 50 thereafter at the venue on day one. 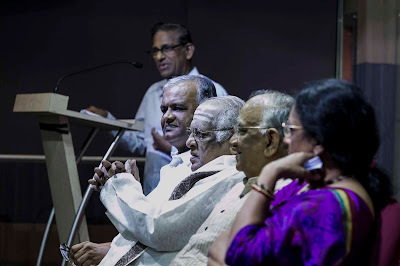 Mudhra, an organisation run by passionate musician couple 'Mudhra' Bhaskar and Dr. Radha Bhaskar hosts a fine arts festival every season curating thematic concerts and performances by young artistes. Mudhra awards the title 'Sangeetha Mudhra' by hosting a competition during the year and the winners get an opportunity to perform with senior artists during the December Arts Festival. T.M. 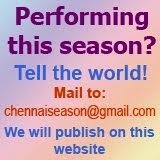 Krishna skips Chennai Sabhas this season too! Many senior musicians as well as up and coming artistes have begun publishing the schedule of their concerts in December this year. The musicians are updating their website, blogs and are also sharing the details on the social media sites, Facebook and Twitter. T.M. Krishna who is among the popular musicians whose concerts are looked forward to eagerly by his fans has also updated his website with the upcoming concerts. But it reveals that he is skipping the Chennai Sabhas and season this year too. Last year ahead of December music season, he announced that he was quitting from the 'season' from December 2015 onwards. The concert schedule page of Krishna's website reveals that he is not singing in any of the sabhas this season too. However, he is performing at Cholamandalam Artists Village and at Jeeva Park in Chennai in December. He is busy participating in many events outside Chennai city in December. So, fans of T.M. Krishna have to get to ready to listen to him at a park or at the artists' campus during December in Chennai. The Chennai Cultural Academy Trust (previously Nungambakkam Cultural Academy Trust) holds its fine arts festival from Dec. 9, 2016 to Jan. 4, 2017. Venue: Rama Rao Kalyana Mantapam (A/c) Auditorium, 111, Habibullah Road, T. Nagar, Chennai 60017. 7.00 p.m. -Kaladarshana presents Panchali Sabadam of Mahakavi Bharathiyar. Music by Rajkumar Bharathi. Choreography - Jayanthi Subramaniyam. 10.30 - Lecture Demonstration on “Significance of 5 (Pancha) in Music” By Anusuya Kulkarni – Bangalore. 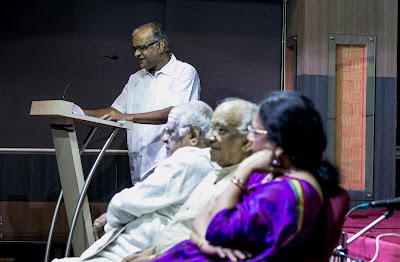 10.30 - Lecture Demonstration - Nagasvara and Tavilvidwans who were Vaggeyakaras By B M Sundaram. 3.00 p.m. - “Katha Nrityam-Sita and Draupadi” - Katha by Sri U.Ve.Dushyanth Sridhar and Nrityam by students of Takshashila Dance Academy, Navi Mumbai. 7.30 p.m. - Kshetrambhuja Maala-Based on Abhujam Krishna’s compostions-Resource person-Smt.Sujatha Vijayaraghavan , concept and Choreography Smt.Anitha Guha . Add on music P. R .Venkatasubramanian by students of Bharathanjali. 7.30 p.m. - Bharathanatyam Dance ballet – Kala Pradarshini Presents Dance Ballet Utchi Thilagam Kalaimamani Smt.Parvathi Ravi Ghantasala and disciples Music L.Vaidyanathan Selected verses by Dr K J Yesudas. 4.30 p.m. - Taraana Academy Of Kathak Dance will be performing to "Navarasa - a kathak presentation depicting the nine emotions" along with a recital of Shuddh Kathak. 8.00 a.m. Devotional Music by Saroja Balasubramaniam group.